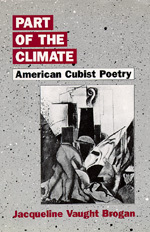 Part of the Climate convincingly redefines American modernist poetry in light of developments in modern painting, particularly cubism. The traditional separation of the verbal and visual arts is cast aside here, as Brogan encourages a re-evaluation of "modernism" itself. Moreover, readers of modern poetry and literature will find this critical work doubly useful, since the author places the poetry of well-known modernists such as Pound, Eliot, and Williams alongside the harder-to-find work of important experimentalists such as Mina Loy, Louis Zukofsky, Gertrude Stein, and George Oppen. Jacqueline Vaught Brogan has assembled this much needed collection of experimental verse from the interwar years by going to the small magazines through which the poems reached their public. She not only shows how significantly many of these American poets of the early twentieth century were influenced by the aesthetic development of cubism in the visual arts but also argues that the cubist aesthetic, at least as it translated into the verbal domain, invariably involved political and ethical issues. The most important of these concerns was to extend the aesthetic revolution of cubism into a genuine "revolution of the word." Brogan maintains, in fact, that the multiplicity inherent in cubism anticipates the deconstructive enterprise now seen in criticism itself. With this history of the cubist movement in American verse, she raises serious questions about the politics of canonization and asks us to consider the ethical responsibility of interpretation, both in the creative arts and in critical texts. Jacqueline Vaught Brogan is Associate Professor of English at the University of Notre Dame and the author of Stevens and Simile: A Theory of Language.